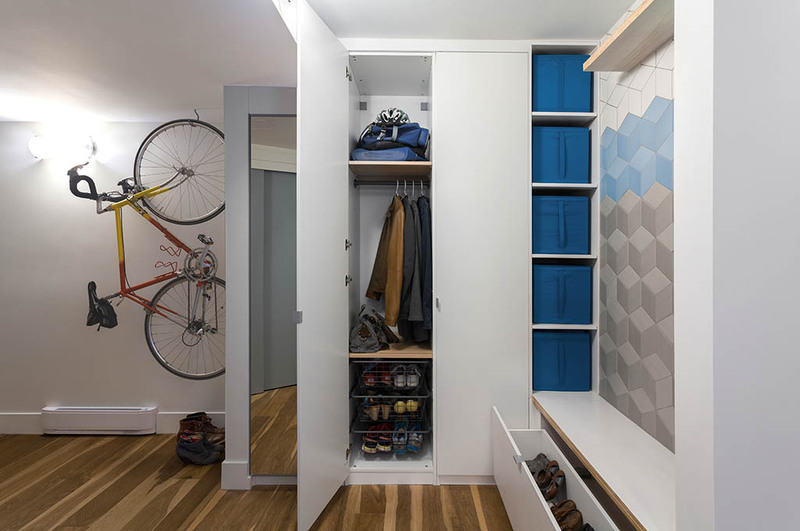 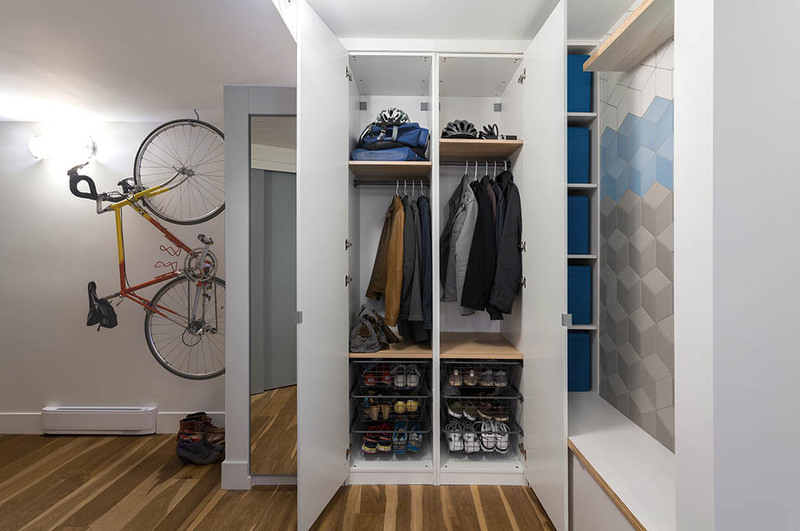 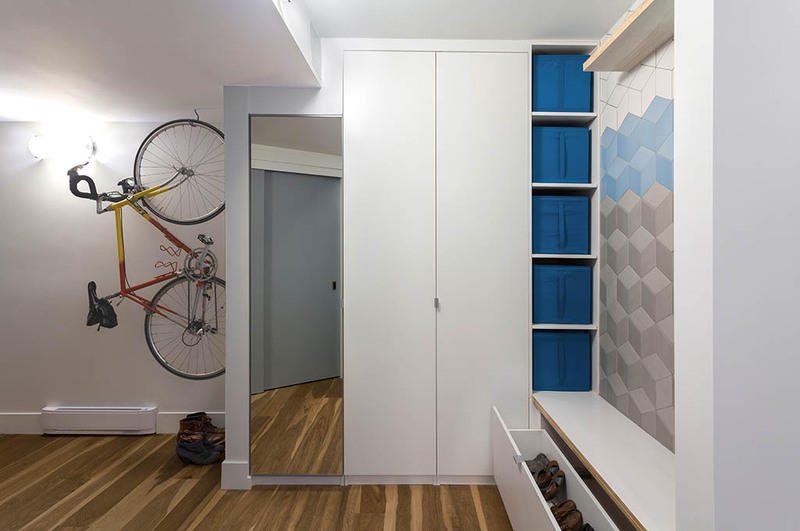 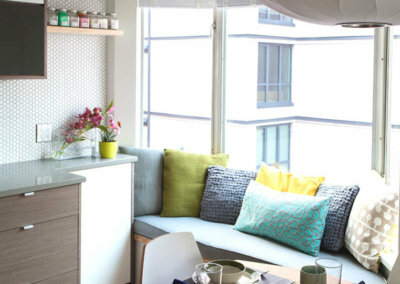 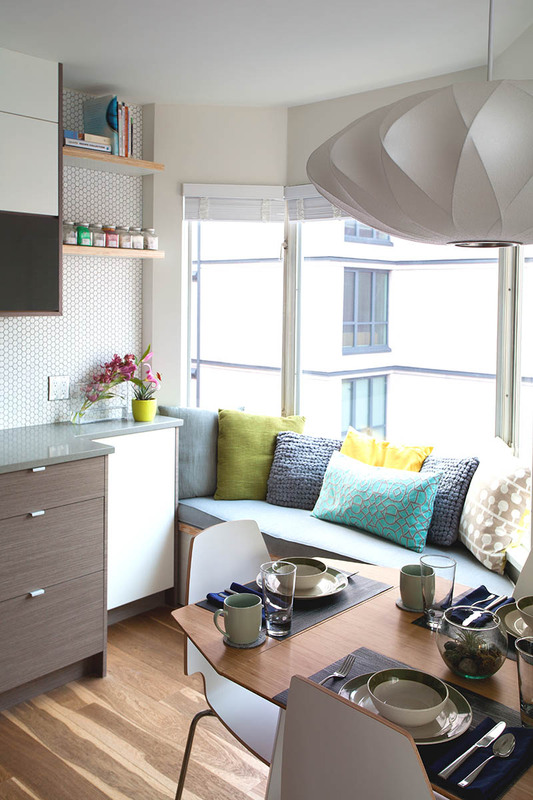 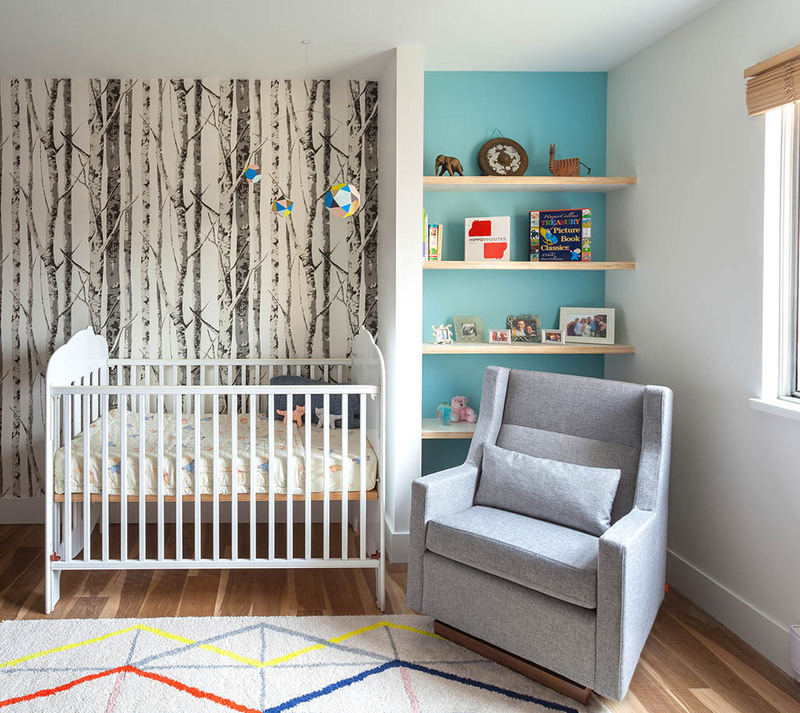 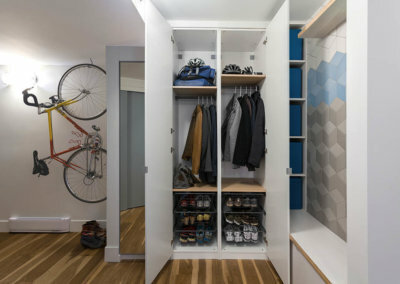 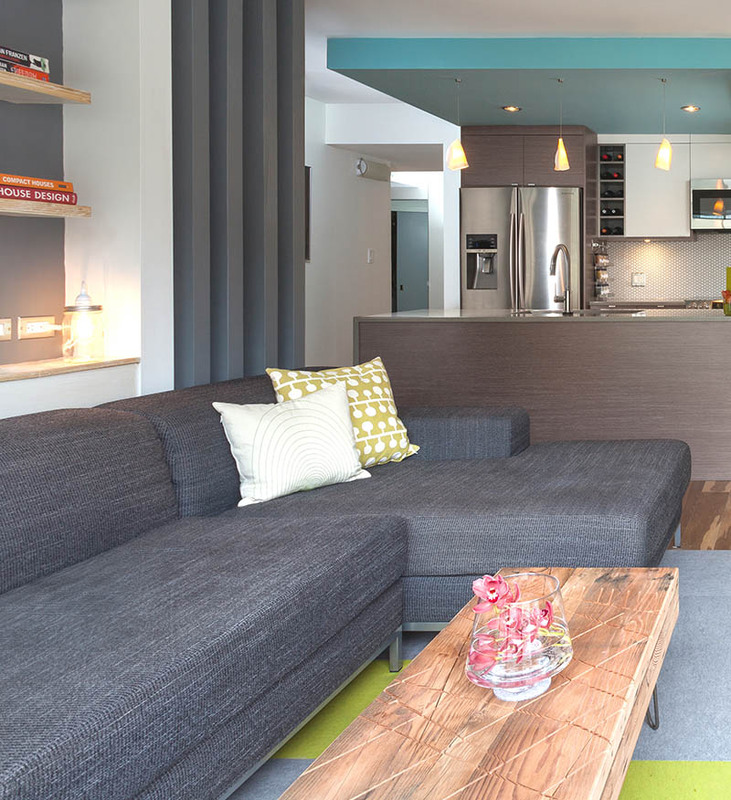 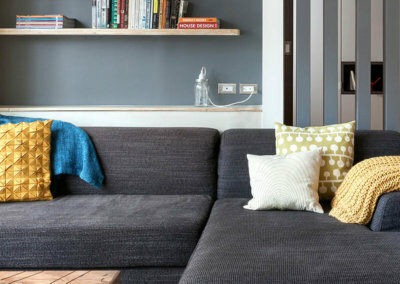 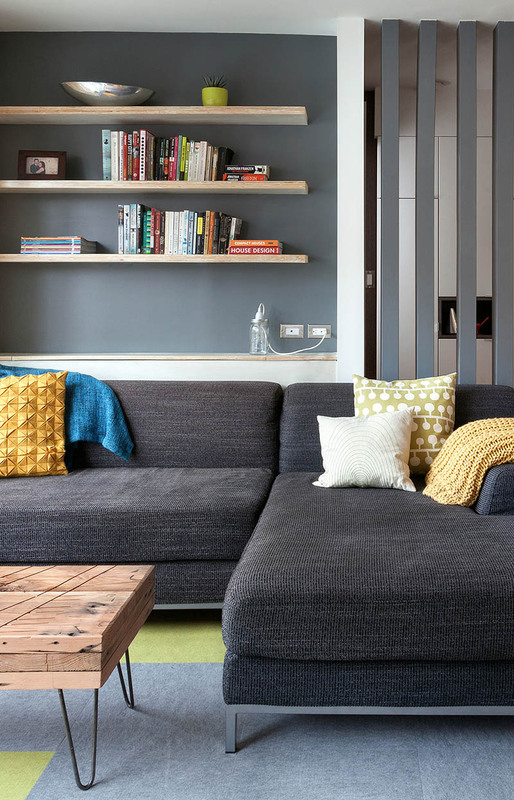 With their first baby on the way, a young couple sought to convert their recently purchased West End condo into their dream urban nest. Both grew up in houses, but were inspired by their travels to Europe and Asia where condo dwelling is a more common occurrence for families. 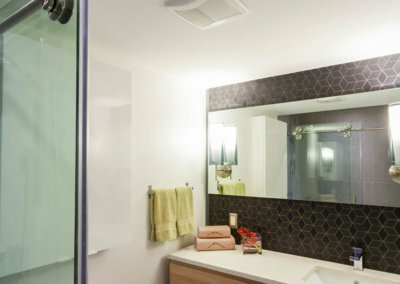 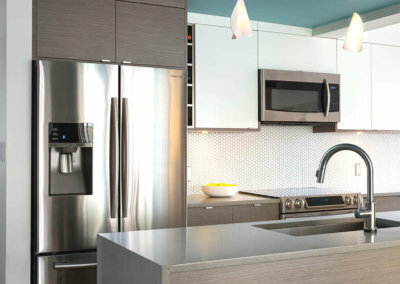 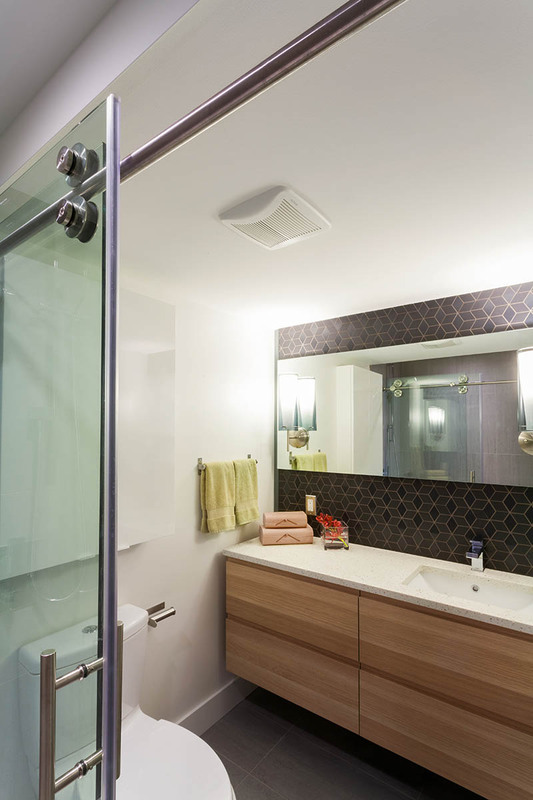 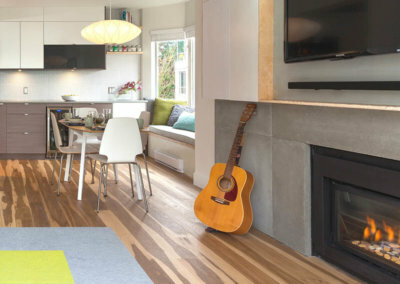 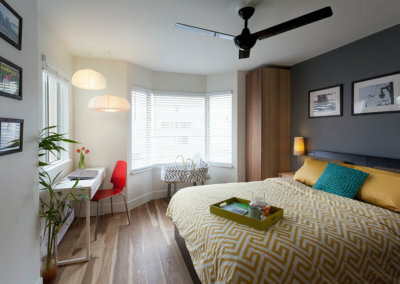 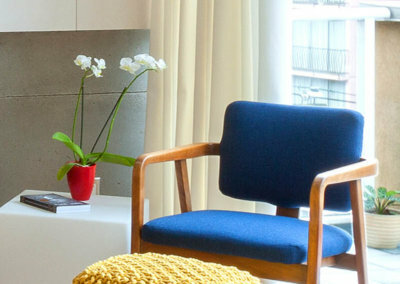 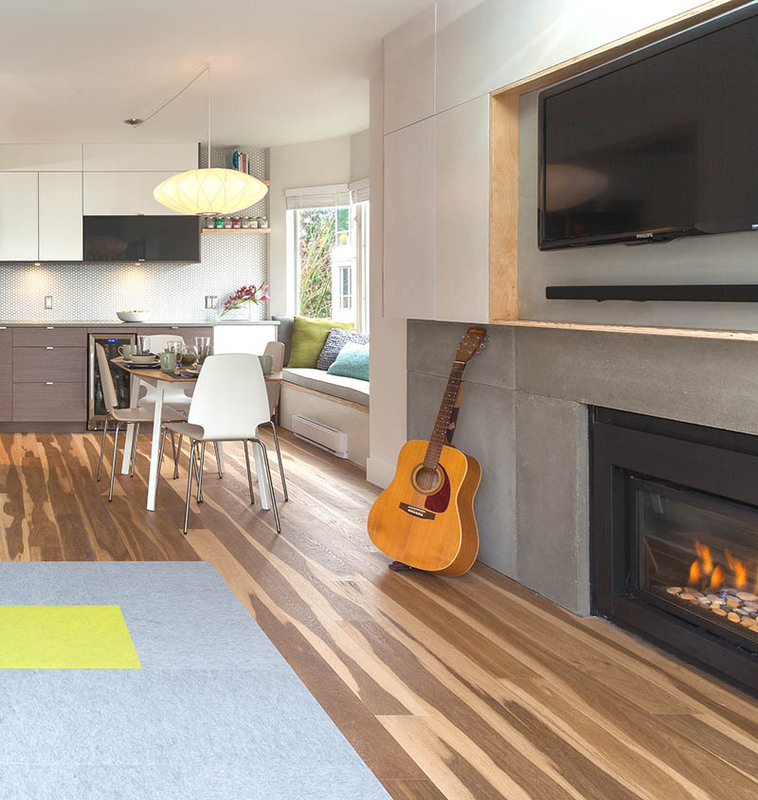 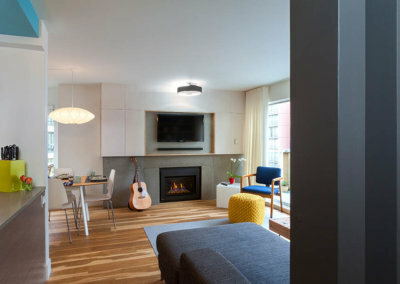 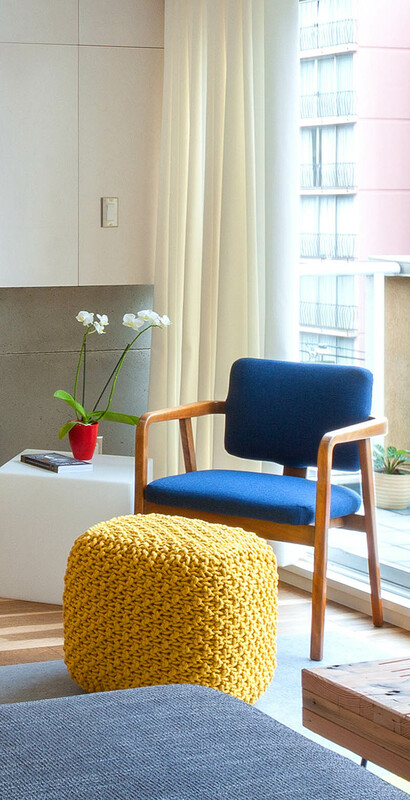 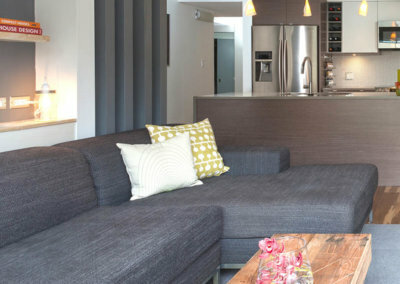 The renovation allowed them to have the best of both worlds: staying in their beautiful urban location close to Stanley Park, the ocean, and their work downtown, while creating a modern and functional home in which to raise their family. 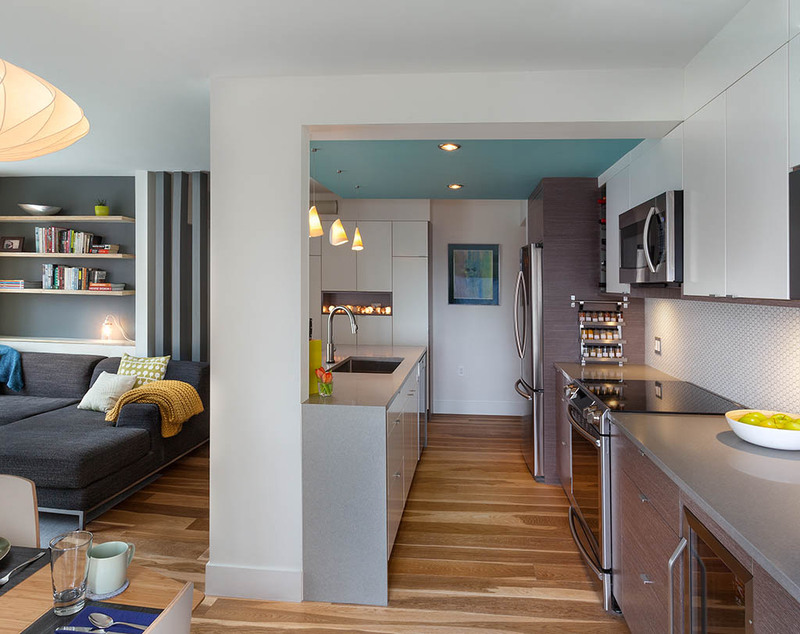 The 1000SF, two bed and two bath condo was a true fixer-upper with outdated finishes and a floor plan that needed refinement. 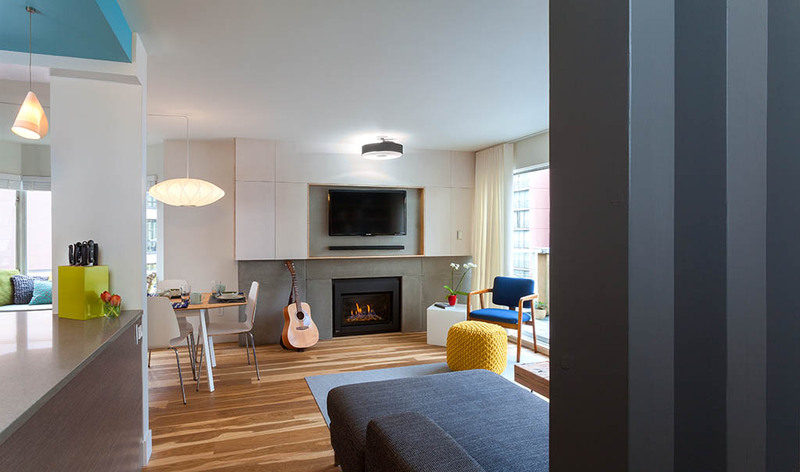 The builder, Vertical Grain Projects, gutted the suite down to concrete and studs, taking down several walls in the process. 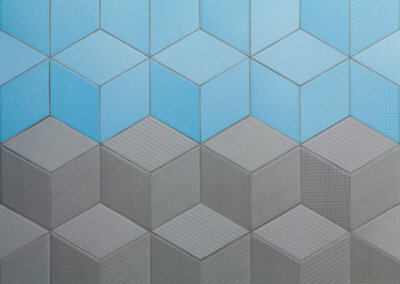 They expertly built it back up, bringing our vision to life. 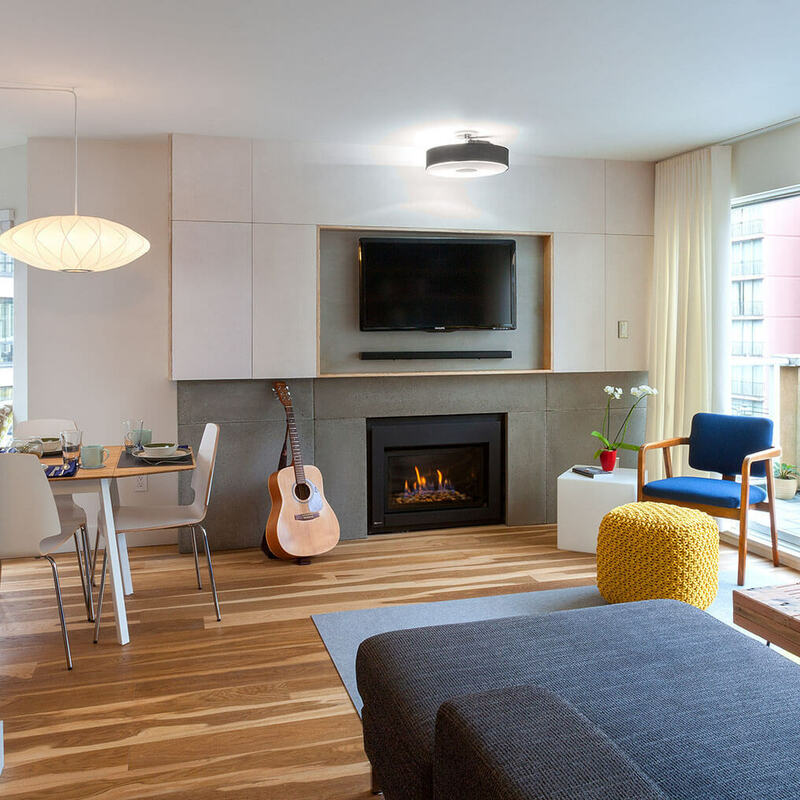 The design was influenced by the character and materials of a converted New York loft, and using the vernacular West Coast Modern language, it was infused with warm wood accents, exposed concrete, and framed views of the North Shore mountains. 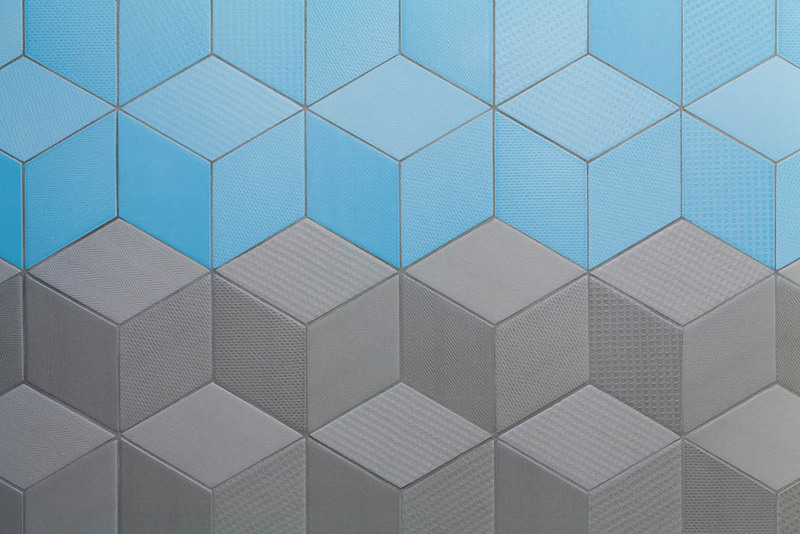 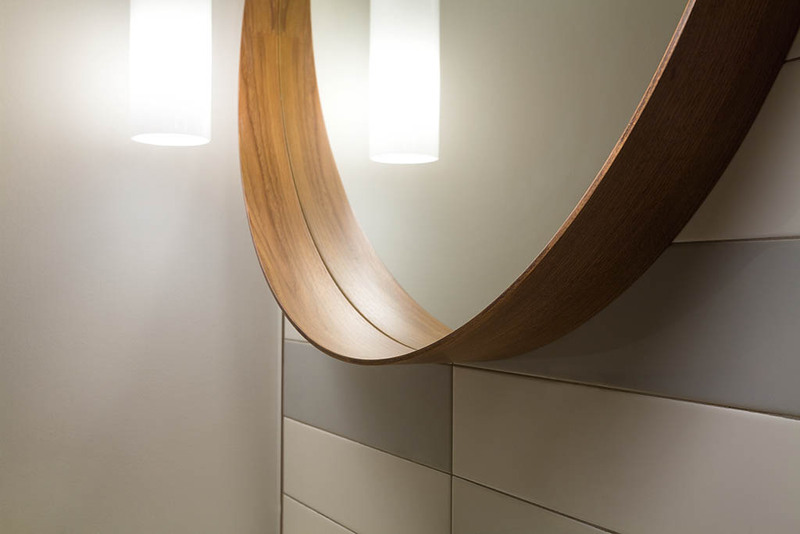 We established a playful balance between strong geometric shapes and flowing organic elements. 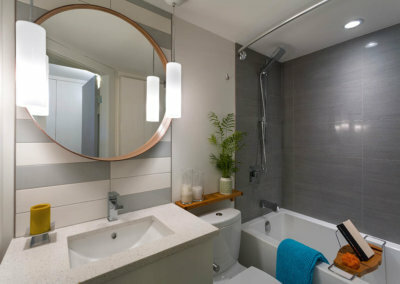 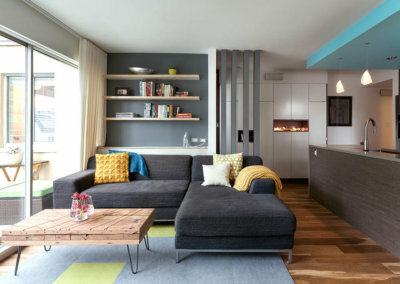 This recurring theme draws attention to the design elements through juxtaposition, facilitating a more conscious appreciation of their unique beauty. 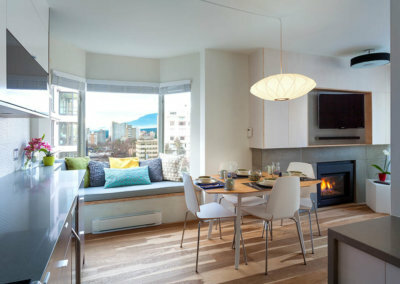 The orb-like Nelson lamp in the dining room, the airy floor to ceiling drapes in the living room, the hand-crafted ceramic pendant lights at the kitchen island, and the birch forest wallpaper in the nursery, provide whimsical counter-points to the clean lines of the interior, including the white-washed floating plywood shelves and geometric patterns of the feature tiles. 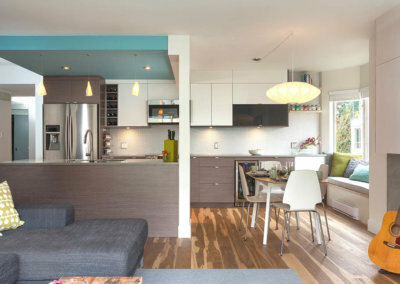 The floor plan was renovated to create an open concept design, where spaces are defined by colour, lighting, and design accents, in lieu of walls and doors. 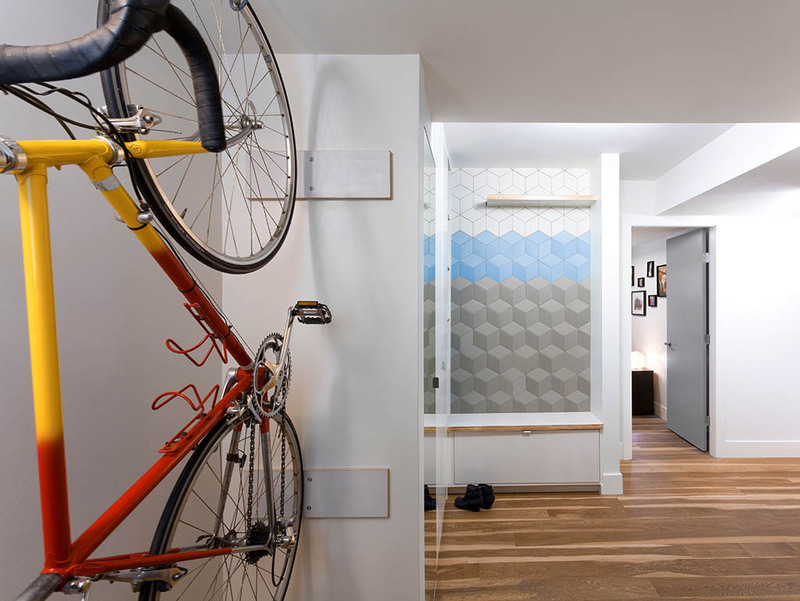 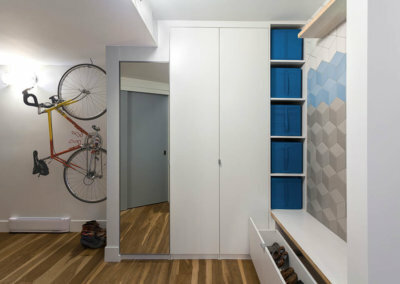 For example, the feature tiled wall and bench at the entry are visible from the moment the door is opened, welcoming guests and creating a desire to explore the space, not to mention providing ample storage and seating. 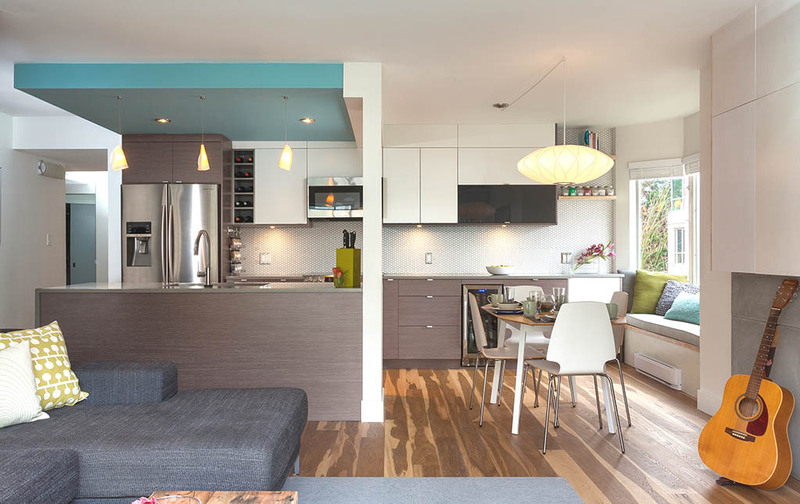 The kitchen is framed by the punchy turquoise ceiling canopy. 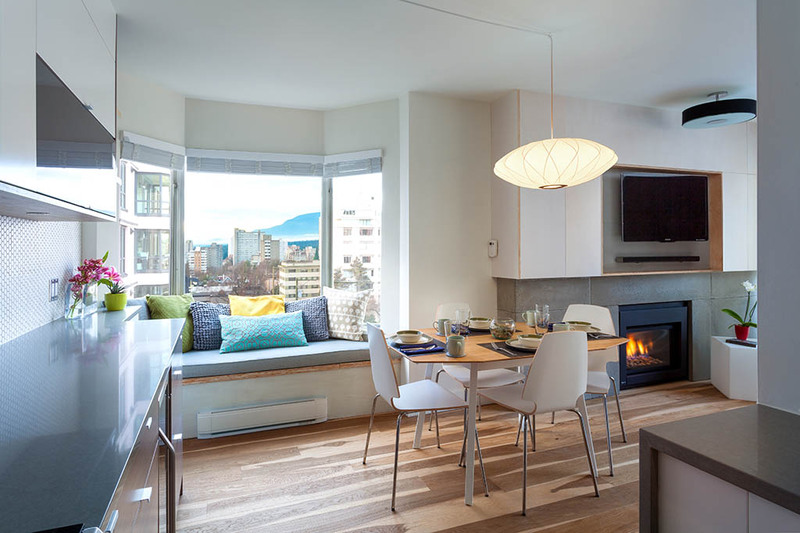 A window seat in the dining area beckons you to take a moment to absorb the stunning mountain views, while also providing storage for baby toys and additional seating for entertaining. 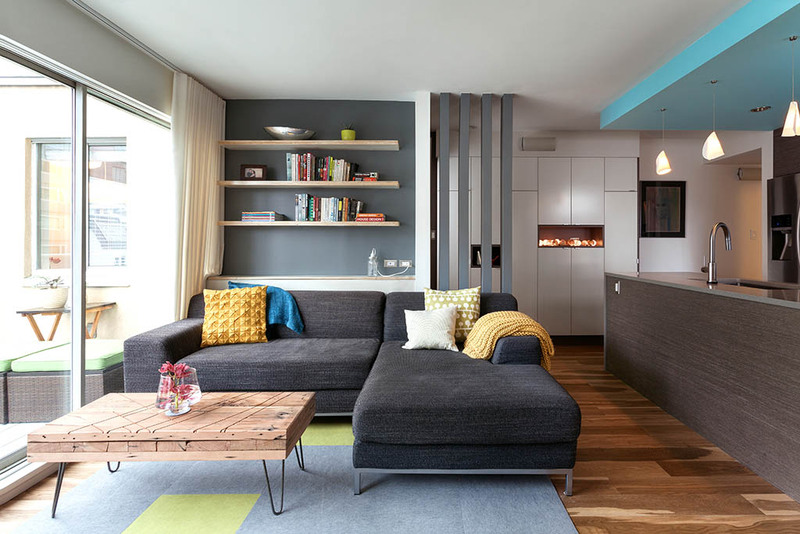 The wood slat wall provides a dynamic contrast to the floating shelves above the couch (dark vs. light, vertical vs. horizontal) while extending the size of the living room and providing a sense of distance and privacy from the master bedroom. 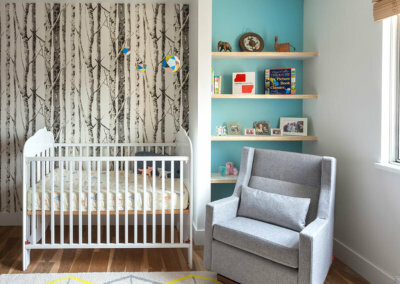 The simple and minimalist design appeals to the owners’ modern taste, and creates a functional and fun, kid-friendly space. 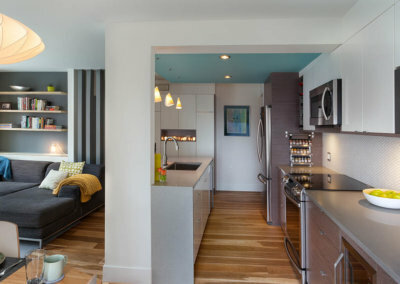 Each morning, when they emerge from their bedroom, the sight of their beautifully renovated condo reminds them of how lucky they are to live in such a well-thought out and striking home.